While we’ll soon be sitting down to Thanksgiving, and Christmas is right behind it, Spring is right around the corner! And with Spring comes an annual tradition at Walt Disney World in Florida: spring training season for the Atlanta Braves. If you’re a baseball fan and plan to be in the area, you just might take a break from the parks and take in a little of America’s favorite pastime. 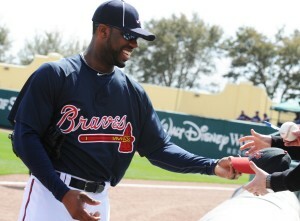 The Atlanta Braves call the ESPN Wide World of Sports home for the spring training season, and when team practice is over, and it’s time to play, lots of other great teams come to join them. The spring training season has been announced. We wanted to share a few highlights of the schedule, which runs from the end of February through late March. The Braves play host to the New York Yankees on March 8. On March 9 and 10, they face the Cardinals, and then the Red Sox come to town on March 16, followed by the Phillies on March 27. There are 18 home games in total to look forward to during the 2011 spring training schedule. Circle the date – individual game tickets go on sale January 8, 2011, but ticket packages are available now for locals or frequent visitors. Individual tickets range from $10-42; mini-plans (packages of 4 games) range in price from $108-112; and season tickets are available for $180-495. Call 407/939-GAME (4263) for more details, or visit The Disney Website to learn more and to see the complete season lineup.